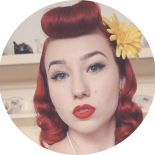 Hello lovelies, today I have for a fabulous video sharing how I’m preparing for the Viva Las Vegas Rockabilly Weekend and my big trip for America. I thought it might be fun to share what I’m doing to get ready my big holiday. It may be helpful, and I’d definitely love any tips you have for me. I’m so excited that I’m leaving for America very soon! If you see me around town or Viva please do come up and say hello! Here’s hoping I can fit all my dressed into one bag and have a bag for all my shopping. This entry was posted on March 30, 2019 by Miss Lady Lace in Videos, YouTube and tagged 1940's, 1950's, blogger, glamour, miss lady lace, miss lady laces pinup blog, perth, perth pinup, perth pinup blog, perth pinup community, pin up, pinup, pinup blog, pinup blogger, pinup fashion, pinup girl, pinup life, pinup lifestyle, pinup perth, red lips, retro blog, retro girl, retro glamour, the perth pinup community, victory rolls, vintage, vintage blog, vintage blogger, vintage fashion, vintage girl, vintage glamour, vintage perth, vintage pinup blog.